Despite government announcing that the relief package will be distributed to the tsunami-affected people without any delay, there are widespread complaints that money was not reaching the victims. 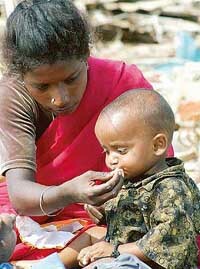 A woman feeds her child at a relief camp in Chennai on Thursday after the area was hit by a tsunami on Sunday. Former Prime Minister Atal Bihari Vajpayee and BJP President L K Advani will be meeting Prime Minister Manmohan Singh soon to discuss the relief and rehabilitation measures being taken in the tsunami-affected areas. The Car Nicobar Air Base in the severely affected Car Nicobar islands can be made ready to operate fighter planes like Sukhoi-30 in about six months and the new plans have only been put off and not cancelled, Air Commodore K.K. Vijay Kumar, Air Officer Commanding, Air Forces Component, Triservices Command, A&N, said here today. The Centre, which began special focus on rescue and relief operations, today declared that a majority of Aboriginals (tribes) in the Andaman and Nicobar group of islands were safe, even as it said aerial surveys were continuing to trace the missing persons there. President A.P.J. Abdul Kalam today called upon scientists to take up the challenge of Tsunami destruction by dedicating themselves towards quake prediction as an important area of research. The INS Gharial is one of the largest ships in the Indian Navy, a mammoth Landing Ship Tank — Large (LST-L), capable of carrying two helicopters, one in hangar and one on deck, 10 Vijayanta tanks in her underbelly, and four Landing Craft — Assault (LCA) slung aloft. She is also armed with guns and rocket launchers, which are used to “soften up” a hostile beach before the tanks go in and the LCAs charge in with assault troops. Patna District Magistrate Gautam Goswami, under fire from the Election Commission for not initiating timely action against ruling RJD for violation of model code of conduct, today resigned from his post. Bihar Chief Secretary K A H Subramanian said he had received the resignation letter of Mr Goswami. Even as the story of Kanchi seer Shankaracharya Jayendra Saraswati’s arrest on the charge of murder has barely shrunk in newsprint, the seamy side of the mutts and ashrams in the holy towns of Hardwar and Rishikesh has sprung into prominence. Along the banks of the Ganga, gurgling down to the plains through the twin holy towns there has been an alarming rise in crime for land, money and power. Former Union Minister and DMK leader Alladi Aruna was today killed in Tirunelveli district, 600 km from here. A local court today remanded Raghu, younger brother of Kanchi junior seer Vijayendra Saraswati, in judicial custody till January 12 in connection with the Sankararaman murder case. “Instead of the Rs 1 lakh announced for a death in the family, they have given only Rs 15,000,” said a fisherman here, who lost a family member, in front of his shambled hut and catamaran. Both Pondicherry and Tamil Nadu governments announced Rs 1 lakh for the affected families, in case of deaths. But, in the Kalapet fishing village, where about hundreds of huts were washed away and many people killed by the waves, the funds are not coming in. Though huts of others involved in building works and other daily-wage jobs, were also badly hit, the government’s relief aids are reaching only the fishing community, some people complain. “How can they discriminate between two groups of people, when both have been affected equally,” asked Arumughan, a building worker, whose hut near the beach, was wrecked in Sunday’s tsunami. Mr Advani, who toured the affected areas in southern India, had on Wednesday demanded that the Prime Minister should convene an all-party meeting to discuss the issue. The Opposition has also set up a calamity relief fund and requested the government to provide three boggies to carry the relief supply collected by the party to the affected areas. Meanwhile, the BJP has accused the Railway Ministry of making no arrangements for ferrying the relief material for tsunami-hit people saying that about 30 truck-loads of supplies were stranded in the capital for want of means to carry them to the southern states. Party Vice-President Mukhtar Abbas Naqvi said his party leaders and workers were running from pillar to post since the morning looking for trains which would carry the relief material even though Railway Minister Laloo Prasad promised yesterday to provide free rail bogies for such a purpose. “The Railway officials say they have received no orders for ferrying relief material free of cost,” Mr Naqvi said and stated that about 30 truck-loads of material, including clothing, were piling up here. He pointed out that along with party President L K Advani, he had both spoken and written to Home Minister Shivraj Patil and Laloo Prasad yesterday seeking provision of free bogies. Both Mr Patil and Mr Prasad had assured to make arrangements in this regard, he said. The BJP leader alleged that it was for the first time that the railway ministry was “not cooperating” during such a calamity. At the same time, party spokesperson Sushma Swaraj criticised the handling of the tsunami calamity saying that the “goof up” on the alert warning issued by the home ministry yesterday reflected the lack of coordination in the government even in the event of a grave crisis. She condemned the “false warning” issued by the Ministry and its dismissal as a rumour by the Science and Technology Minister Kapil Sibal. The confusion created by the warning brought all relief work in the affected areas to a grinding halt, she said. She termed as ‘shameful’ the government’s attempts to blame media for its “own mistakes”. The first focus was the runway itself. The runway, which was about 8,700 feet long, was now operational only to an extent of 6,500 feet or so. “Along the entire length of the runway, there are cracks and chip-offs.” And the runway was taking tremendous pounding, with an average of 30 sorties of AN-32s and four to five sorties of the large IL-76 taking place everyday. They were heavily loaded, depositing an average 35 tonnes of supplies a day. The runway repair had to be done with epoxy filling and this could be done in five to 10 days, once the pace of the sorties abated in about a fortnight. The basic infrastructure to operate AN-32s and Mi-8 helicopters could be up in three months, he stated. There were five Mi-8s stationed there, and all were affected by sea water. Three were now checked and operational, and two more were waiting to be readied. The total casualty figure for the IAF was 102, with 25 bodies accounted for and the rest missing and presumed dead. This included six officers and 23 of their family members and six men and 67 of their family members. The multi-role Sukhois can be used to support the amphibious operations the Triservices Command focused on here, by ensuring air superiority, with air defence, counter air operations, and battlefield interdiction. Their long range and air-to-air refuelling capability made them ideal to be operated out of a remote but forward location eastward like Car Nicobar. “Special emphasis is being laid on the rescue and relief operations in the Andaman and Nicobar group of islands, which is the worst affected and as per the status report available with the Crisis Management Group (CMG) as on 4 p.m. today, a majority of aboriginals (tribes) are safe,” Secretary (Disaster Management) A.K. Rastogi told mediapersons here. Stating that the worst-affected tribe is Nicoborese, with reports of 656 deaths and 3,000 missing, Mr Rastogi said an aerial survey was still being done to assess the safety of the Shompens tribe, numbering 398, in the Great Nicobar Island. As per the 2001 census, Nicoborese population was 28,653. While all 49 persons belonging to Andmanese were safe in Adi Basera, Port Blair, 94 out of 96 persons of Onges tribe were safe in the Little Andaman, 266 persons of Jarawas tribe were safe in middle/south Andaman and 32 of 39 persons belonging to the Sentinelese tribe were spotted on December 30 during a Helicopter survey. Stating that the official death toll had increased to 7,763, the number of missing persons had fallen from yesterday’s 5,900 to 3,000, Mr Rastogi said. There were reports of nine missing persons in Andhra Pradesh and two in Kerala. Giving details about the relief and rescue operations, he said as many as 12 ships of various sizes and 16 fixed-wing aircraft/helicopters had been pressed into service to reach out relief materials to various tsunami hit areas in the Andaman and Nicobar Islands. Out of the 856 MT of relief materials arranged so far, about 200 MT had reached the Nicobar Islands. High priority was being given for despatch of tents, torches, generators, food items and drinking water, he said. “All small harbours and jetties have been damaged and it is not possible to park any vessels...Efforts are on to restore the facilities and pending restoration of shipping facilities. The supplies are being airlifted,” Mr Rastogi said. The Port Blair airport had been made functional for Air Force flights for AN-32 and IL-76 flights and link established on the small airstrip at Camp Bell Bay and the Dornier aircraft was running, he said, adding the Ministry of Defence had pressed into service three IL-76 and five AN-32 aircraft specifically for relief operations to Car Nicobar. In the wake of telephone lines and equipment having been completely washed away in the Nicobar Islands, the Ministry of Home Affairs had dispatched eight satellite phones with two operators. The BSNL had deputed six teams along with equipment to establish point-to-point communication in these group of islands. By late this evening, as many as 1,356 volunteers belonging to various paramilitary forces, civil defence and other voluntary organisations were engaged on the ground in Nicobar Islands to reach out relief material to the affected people there. “India should take it up as a challenge. It may take some years, but it is important to make advances in this area,” the President said. He said the university could build linkages with universities in other countries such as Japan and the US and bring about an international cooperation for quake prediction. He said another important aspect of the tsunami disaster was the tidal wave caused by the earthquake and urged for bringing the tsunami warning system to the Indian shores in view of the devastation caused by tidal waves in the country. “The tidal wave moves with a certain velocity and a warning can be sent out if it is sensed in time. Around 27 Pacific nations already have an understanding for a tsunami warning system,” Mr Kalam said, adding that there was a need for setting up such a warning system for the Indian Ocean too. But the seven-year-old warrior has distinguished herself in the Andamans by playing a key role in the relief operations. And, on board a craft that does not even allow women on board during normal times, for becoming the first naval ship to actually have a pregnant woman give birth to a baby girl while being evacuated from Hut Bay. And what did the thrilled naval officers want to call her? Tsunami...” Doesn’t it sound like a girl’s name,” smiles Lt. Cdr. Ranadeep Bose. It could not be ascertained if the parents actually have decided to take them up on their suggestion, given the tragedy now associated with the word. While on her way back, under the command of Commander A. Venugopal, the quake and tsunami waves struck, and the ship was called in for the relief operations. She became, in fact, the first ship to reach the devastated island of Car Nicobar. Mr Subramanian said Mr Goswami had sent his resignation letter to Secretary, Personnel Ravi Kant with a copy to him. However, he did not cite any reason for his resignation. With two murder cases of sadhus in the sister holy towns in the past couple of weeks, adding on to over a dozen in the past few years, the police have swung into action. A sadhu, known to teach yoga and give ayurvedic medicines, was found murdered in Hardwar on December 27. Still clueless to the killer of the 70-year-old Sant Yogananda, who was found lying in a pool of blood in his cottage on the Bahirav Mandir road, the cops are working out preventive measures. “We will maintain a logbook listing the important details about the sadhus in the mutts and ashrams, apart from information on the ashram, says Hardwar SSP Abhinav Kumar. The records would be complete with the whereabouts and past records of the ashram inhabitants. The police recently arrested Ratan Das, alias Lal Baba, an associate of a famous sadhu from Rishikesh, Swami Ramanand, on the charge of murder for property. Swami Ramanand Giri (76) of Ramanand Ashram in Muni ki Reti, who had gone missing on November 10, was murdered the following week, allegedly by Lal Baba (45), his man Friday for six years. He won the confidence of the baba by taking him to his home for ‘katha’ frequently. According to the report lodged by Swami’s guru Prakash Chand Maharaj, the accused arrived at the ashram on November 28 with a forged will claiming that the sadhu had left him all his property. The will was examined and found to be forged, the police says. Investigations followed and during interrogation, Lal Baba admitted to the crime, the police says. A case has been registered against him. In the past few years, an alarming number of sadhus have either gone missing or have been murdered. A number of ‘missing’ sadhus, mostly in their twilight years who have left behind property worth lakhs to their inheritors, do not even find place in police records. A big number of them fall prey to the designs of men in holy garbs who approach them with murky motives and become their associates. Not only the police but also the sadhus residing in the ashrams have come together to take preventive measures against the rising tribe of ‘sadhus’ tough to tell from the real ones. Fear of their look-alikes in loose robes with messy mane, looking to take the easy road to money and land, stalks them. The sadhus in Rishikesh have constituted a society to look into the cases and take care of their security concerns. According to Mahant Suresh Das of Sadhna Mandir, Bhrampuri in Rishikesh, such mechanisms have become mandatory to protect the sadhus from miscreants in the holy garb eying their properties which runs in crores of rupees in a lot of cases. These people have a way of life in complete disagreement with the austerity befitting a sadhu, and bring us a bad name, he says. He however admits that Mahant Kamalnayan, the man behind Sadhna Ashram has been missing for the past few years. Although it eludes the police records, the locals have the story of Ramanand Shastri of Manokamna Sidh temple of Rishikesh who, according to the ashram sadhus, has gone missing. While some of the locals believe that he was killed in Rishikesh, the manager temple Jitendra Panchal told The Tribune that since he was just one year old in the temple, he had no information about Ramanand Shastri. The Hanuman Mandir over looking the Ram jhoola has a similar story, which the present sadhus would not like to talk about. Mahant Nritya Gopal Das from Ayodhya who established the ashram, is an old name on the list of missing sadhus. Around sundown, along the Ganga when the chants get louder and bells begin to ring its time for the present head, Mahant Prabhu Das, to send for his sandal paste, readying for an evening session with the bhakts the Mahant — averse to being asked the whereabouts of the founding sadhu — says he has no idea where the missing godman is. A number of men in holy garbs are allegedly involved in cases of drug selling apart from land grabbing, only a marginal number of which are reported. A number of these men are reportedly on the run from law. Over two years ago in Hardwar, six persons died in a clash understood to have taken place over a woman who was living with one of the sadhus. The twin towns are replete with not-so-holy mysteries lying buried along the crowded Ganga ghats that see hordes of pilgrims taking a holy dip on a daily basis. Mr Aruna, who was denied nomination for the Lok Sabha poll and later expelled from the DMK, was on a morning walk with his friend when they were shot and hacked to death. According to the Tirunelveli police, the assailants came on two-wheelers and confronted Mr Aruna and his friend. They deliberately picked up a quarrel with the 70-year-old politician and fired at the two from a country-made pistol and then hacked them to death. Mr Aruna who was hit on the chest by a bullet, fell down and the attackers hacked him to death on the spot. His friend, Mr Pon Raja, teaching in the college run by Mr Aruna, who was also hacked died on his way to hospital. The police has arrested a person named Socrates, who was accompanying the victims but escaped unhurt. Kancheepuram Judicial Magistrate G. Uthamaraj told the accused that he was arrested under Section 302 (murder), 120 B (conspiracy) and 34 (abetment) of the IPC and remanded him in Central Prison, Chennai.